Let me begin by re-stating what I said here: Dessert makes my world go round. I have a sweet tooth of epic proportions. It has become the stuff of legends. And lucky enough for me, I live in New York City, a place never short on dessert establishments. Here is my five favorite desserts in New York City. The same owners who have successfully established and upheld the reputation of Artichoke Basille’s Pizza and Brewery are also responsible for the fabulous dessert spot, Led Zeppole. As you can gather from the name, their specialties are zeppoles, which are balls of fried dough smothered in white, powdery confection sugar. The other desserts on their menu include fried Oreos, cream puffs, fried Twinkies, fried peanut butter and jelly sandwiches, funnel cake, cannolis, Italian ices, soft-serve ice cream, and waffle ice cream sandwiches. My personal favorite is the fried Oreos. 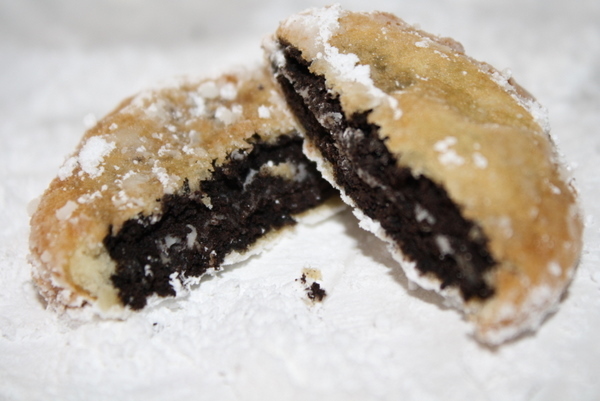 There is nothing as novel as America’s favorite cookie, deep fried, and coated with powdered sugar. This may not be an everyday type spot, due to the richness of such a treat, but it sure is good when you’re in the mood for that special something to satisfy your pallet. This next dessert location is rather unique. 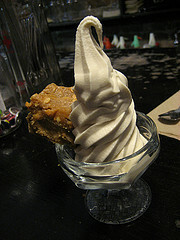 Momofuku Milk Bar is owned by accredited chef David Chang, who has lucratively launched many restaurants including, Momofuku Noodle Bar, Ssäm Bar, Ko, Pêche, Seiōbo, and of course Milk Bar. Here, they offer a variety of unique “pies,” cookies, cake truffles, shakes, soft serve ice cream, croissants and bread. 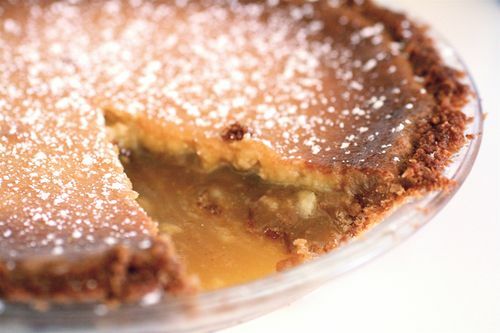 The pies are served by the slice, although full pies are available for purchase, and come in an assortment of original flavors; the Crack Pie, which is my favorite, comes in a crumbled oatmeal cookie and brown sugar crust, with a rich creamy filling consisting of brown sugar, egg, butter, vanilla and heavy cream to hold it all together. The taste is incomparable, as is everything at Momofuku. My other favorite item here is the birthday cake truffles. The little spherical shaped truffles hold immense flavor that overpower your taste buds with sweetness as the colored sprinkles evoke a jovial feeling as you bite into these delicious dessert specialties. It is so difficult to explain just how great Momofuku’s creations are because of the uniqueness of their offerings, so you must go try for yourself. 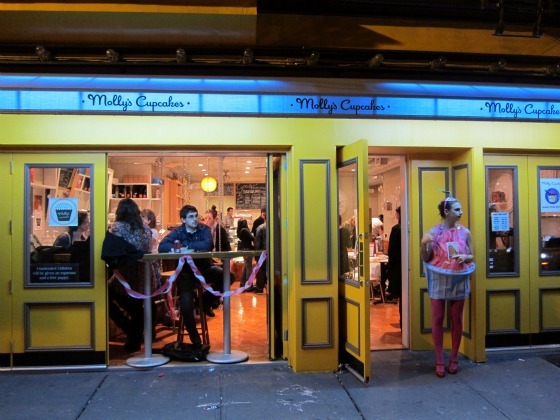 Molly’s Cupcakes captures you from the beginning, as its pretty and quaint yellow paneled façade catches your eye and allures you inside, where you’ll find a country styled seating area with marble topped tables and chairs, and wooden counters atop the bakery showcases. What I love about Molly’s is the freshness in their products. 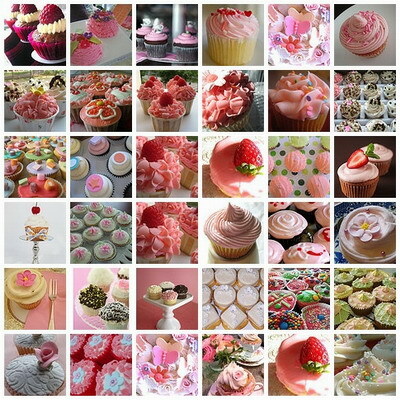 Their specialty, obviously being cupcakes, although they do have assorted other bakery goods, is baked homemade on premise everyday, which becomes obvious after taking a single bite out of a Molly’s creation. There are so many flavors available here that you will never see anywhere else – my favorites being the crème brulee and the happy birthday (which is a level above any other bakery’s attempt at this style of cupcake). Each flavor tastes exactly as the name describes. The happy birthday is filled with a delicious filling that tastes and has the consistency of raw cake batter. The crème brulee fittingly has a custard filling, and the top of the cupcake has that torched sugar taste like actual crème brulee. The best part of Molly’s is the little counter area where they have fun shaped sprinkles that you can add to your cupcake or carry out on the side. I love giving my business to such an amazing little local bakery. It may not have the level of corporate branding as chain cupcake bakeries do, but the homemade atmosphere from décor to baked goods makes you feel at home, which has gotten me to come back time after time. I sought out the waffles from this cart one day to appease a hankering I had for a good old Belgian waffle. I had seen this cart around the city, and had to act on my craving, which brought me here for the first time. The Brussels waffle was my first endeavor and I chose to top it with strawberries and whipped cream. This waffle looks and tastes like a classic waffle you make in a waffle maker. It was delicious, but did not compare to the second waffle I ordered and have been ordering every since. 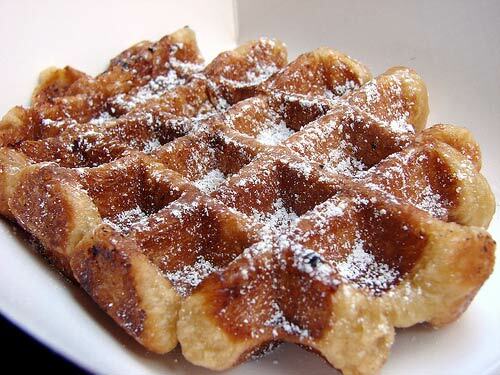 The liege waffle is a thinner and sweeter waffle. When topped with speckuloos, which is one of their signature toppings, this waffle sends you soaring through an unfathomable dessert dream. They heat up the waffles before they top them, which makes this creation even more delicious. This is a sweet and filling dessert and ever since the first time I tried it I have been hooked. Lula’s reminds you of the tiny little country store you would see on the Andy Griffith Show. Lula’s welcomes you with a black and white checkered tile floor, and a wood counter topped with penny candies. The front freezer holds the homemade ice cream flavors, and in back is the soft serve machine where the most incredible cake batter soft serve ice cream is dispensed. I have come here in the rain, the snow, and the sunshine just to get some of their cake batter soft serve. When you take your first spoonful, you don’t exactly know what hit you, nor are you able to fully make sense of the grandness of the flavor. It tastes so similar to actual cake batter that if you closed your eyes you would think that you are really eating a piece of cake (except for the coldness of the ice cream). When I finish my Lula’s I am always left wanting more. I never tire of this flavor, and do not foresee that happening in the future. It is one of my absolute favorite desserts in the city, and if you live in the area I highly encourage you to try it one day. I’ve been looking for new dessert places to try… my girlfriend will love this post. I’ve been Milk Bar more times than I should admit, but I haven’t tried anywhere eles on your list. I liked this post so I can make sure to follow up on all of these places! If you are interested, I recently wrote a post of eating in the East Village with a dessert section at the end. My guess is you would like these spots if you haven’t tried them yet. Is Rajon Rondo the East’s Last Hope Against the Evil Empire?